There are many effective obliques exercises you can do in the gym. 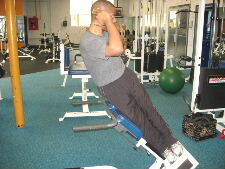 Side bends with added rotation on a roman chair/ hyperextension board will really work your obliques. Below are pictures and instructions for this exercise. Starting Position: Adjust the roman chair or hyperextension board so that your thigh rests comfortably on the pad. Secure your feet and place your hands behind your head. 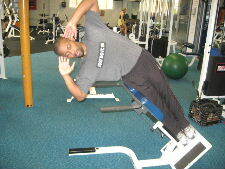 You should feel a slight stretch in the obliques in the starting position. Form: Exhale and raise up your body until your trunk is parallel with your legs. At that point, rotate your bottom elbow up towards the ceiling and continue side bending until you get to the end of your range of motion. Hold for a brief second and then untwist as you lower to the starting position. Personal Trainer Tips: Move in a slow and controlled manner, and do your best to focus on twisting your body and not just your elbow. This exercise is very challenging on the oblique muscles and also the lower back. If you are a beginner, first master an easier version of side bends on the roman chair. Always listen to your body. The exercises that challenge the obliques muscles also challenge the lower back muscles, so build up slowly. If this exercise gets really easy after weeks of practice, you can try it with a medicine ball to add some resistance. This is just one exercise for your oblique muscles. 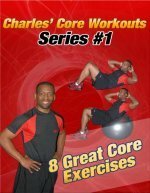 If you don't have access to a gym or this machine try another one of the obliques exercises on this site. But remember that ab exercises by themselves won't get rid of your love handles or give you a 6 pack. If you want to lose stomach fat you must take a comprehensive approach to fitness and health.